RIALTO – Drinking water near a contaminated manufacturing site in the north end of town is safe and those who work there are not at risk from exposure to chemicals, state public health officials have concluded. The BF Goodrich site is a 160-acre area where several companies used perchlorate and trichloroethylene during the production of fireworks and other explosives from 1952 to the mid-1980s. Trichloroethylene is an industrial cleaning solvent that affects the central nervous system and has been linked with various cancers. Perchlorate is used in rocket fuels and fireworks. Studies have suggested it can interfere with the functioning of the thyroid gland and mental development. Before the EPA stepped in, the Santa Ana Regional Water Quality Control Board oversaw monitoring of the site. 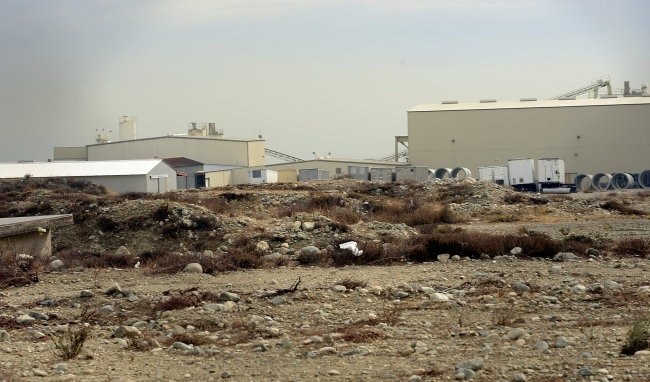 A view of an industrial area known as the BF Goodrich site in north Rialto, CA. Such sites by law must be cleaned up and companies that dumped the chemicals in many cases are required to pay for the fix. A settlement agreement between Rialto and the local companies could be signed as soon as December. The state Department of Public Health worked with the federal Agency for Toxic Substances and Disease Registry in looking at the health effects of the BF Goodrich site’s chemicals on Rialto residents. The Atlanta-based federal agency is part of the U.S. Department of Health and Human Services. Investigators looked at the amount of perchlorate and trichloroethylene in the air, soil and groundwater at the site, and whether workers there and nearby residents since 1952 had contact with the chemicals. The groundwater at the site contains perchlorate and trichloroethylene, but is deep enough below the surface not to be a threat, and businesses at the site don’t use it for drinking water, according to the report. Manufacturers dumped the chemical waste onto the ground and into pits on the BF Goodrich site. The chemicals then leaked into the ground and the Rialto-Colton Basin. Manufacturers stopped dumping the chemicals around 1985, but the pits still leaked, according to the report. Officials test local drinking water regularly to make sure residents aren’t using water with levels of perchlorate and trichloroethylene that could damage their health. “The reality is we’re not serving contaminated water to our residents,” Councilman Ed Scott said. Trichloroethylene testing became a requirement in 1989. Perchlorate testing began in 1997. According to the report, it isn’t possible to know whether eating vegetables or fruits from a garden would have been harmful before 1997. The state Department of Public Health conducted a series of meetings with Rialto residents to learn about their concerns about contamination at the BF Goodrich site. Most of the concerns were about chemicals in the drinking water and whether they could be linked to thyroid diseases, migraines, attention deficit hyperactivity disorder, allergies, skin rashes, miscarriages, stillbirths, and birth defects. They also were worried that children exposed to contaminated water began to talk later than normal. Other residents asked about white residue left by water. Investigators concluded that the levels of perchlorate locally would not have been high enough to impact an adult thyroid gland, and exposures in the study would not be expected to cause speech delay. Perchlorate exposure has not been linked to allergies, skin rashes, miscarriages, stillbirths, or birth defects, according to the report. Trichloroethylene exposure has not been linked to miscarriages or stillbirths, investigators said. But some who have had direct skin contact with the chemical have reported skin rashes. High levels of trichloroethylene exposure have been known to cause allergies, according to the report. Perchlorate has not been shown to cause attention deficit hyperactivity disorder, but studies reveal a possible link between trichloroethylene and the disorder. According to the report, perchlorate hasn’t been linked to kidney cancer, but both animal and human studies have linked trichloroethylene with the disease. It is unclear as to what amount is related to kidney cancer. Investigators said the white residue that residents see when water dries on a surface is caused by minerals like calcium and magnesium. High levels of the minerals are not associated with health problems. Neither perchlorate nor trichloroethylene leaves a white residue, according to the report. Editor’s Note: Reprinted from Contra Costa Times. More from the EPA Website.